Buying Links: Amazon* | Kobo | iTunes* | Barnes & Noble * affiliate links; the blog receives a small commission from purchases made through these links. Marley has settled into her life in Wildwood Cove; she's getting a handle on running her pancake restaurant, has a steady relationship, and has several murder investigations under her belt. Just when her life seems to be running smoothly, things get bumpy again. A movie comes to town to shoot a remake of a classic horror movie. This was a good move on Fox's part. It opened the pool of murder suspects and made another murder in her small town a likely occurrence. The problem with so many cozies is that they lack believability as to how many murders can occur in a small town. I'm often surprised that Cabot Cove has any residents left. So the movie filming on location was a neat way around that problem. Marley helps put out a trailer fire on the movie site but the woman in the trailer is dead, murdered as it turns out. Marley feels a connection to the woman and can't help but ask questions. Then she finds out that the prime suspect is the lead actress in the movie who also happens to be her boyfriend's ex. An ex he never mentioned, who expects him to influence his uncle, the chief of police, so that she's no longer a suspect. While I understood Marley being upset at how she found out about the ex, Alyssa, I thought it was immature of her to run away and refuse to talk to Brett. They finally did talk it out but it took too long. She did that in the last book too and I am surprised that Brett puts up with it. There was too much personal drama for my taste especially as Marley is quick to run away when her feelings get hurt. Despite, or because of, her feelings about Brett and Alyssa, Marley decides to continue asking questions and investigating. She hopes that by either clearing Alyssa or proving her guilty, she can get Alyssa out of their lives. So she pokes around, becomes friendly with some of the cast and crew, and becomes a familiar sight on the film location. Marley handles herself well for an amateur; she's mostly smart and cautious as she investigates, though she makes a couple of stupid moves. In addition to the murder, there are pranks and thefts on the set that are slowing down production and costing money. But there's no lack of suspects or motives for the murder or the thefts, and narrowing them down is a challenge. The final reveal of the murderer was a complete surprise and I do mean complete. There weren't any hints along the way as to the identity. I was completely blindsided. There were a lot of threads to the mysteries and they intertwined. Marley and her helpers were persistent and thorough and left me wondering just what the police were doing. 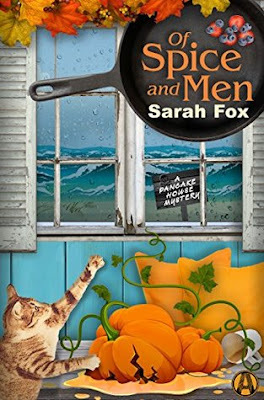 "Of Spice and Men" offered up a convoluted mystery, lots of suspects, interesting characters, personal drama, yummy food, a peek at movie making, and an enjoyable story. It didn't wow me, but it did keep me reading. I had to know who the killer was because I couldn't figure it out. Oh I'm sorry to hear this didn't wow you. I have this series on my TBR but I don't like a convoluted mystery or when the killer kind of comes out of no where. Yeah, I'm not a fan of the villain being a total surprise but I like the setting, and the food. :D It's not a great steries but it's decent. 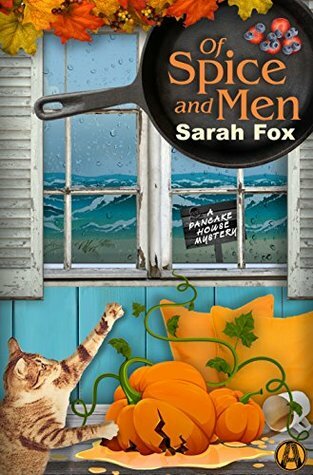 Of Spice and Men is an excellent cozy mystery that has it all - a great lead, lots of suspects and a colorful plot. It even has a touch of romance. I definitely recommend it to anyone who enjoys cozies. As an added bonus there are yummy sounding recipes.